“Muriel Stockdale is a British-born visual artist and theatrical designer who moved to America in 1967 and currently lives and works in New York City. One of Muriel’s recent projects, entitled “E Pluribus,” is a series of flags exploring the concept of “patriotism” in the United States. The flags are handcrafted in mosaic tapestries to represent how a diverse nation like America can co-exist in peace and harmony. Muriel has been working on her series of American flags since 2003 and is always expanding the project to include others. Muriel was an instructor at New York University’s Tisch School of the Arts as part of the Graduate Design Department. 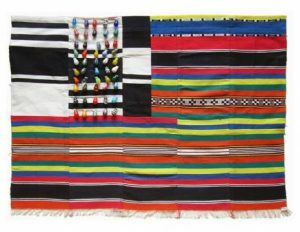 Aside from her “E Pluribus” flags, Muriel recently completed a novel titled “Gabriel Born” and was invited to create a large diversity flag for a temporary installation at 3 World Trade Center. Muriel recently discussed her projects in an exclusive interview. “Mounted on the clean white walls of Charlotte’s Place, Trinity Church’s airy new multi-purpose community space in lower Manhattan, close to two dozen bright rectangles of color and light invite neighbors and visitors into conversation and community. Betsy Ross and Muriel Stockdale have two things in common, creating flags with the hope of bringing a nation closer together. Stockdale’s E Pluribus is a United States flag series, which expresses the many colors of patriotism found everyday in the United States. For the 10th anniversary of September 11, 2001 attacks, Stockdale is working with Charlotte’s Place, a community center opened by Trinity Church to create a new flag, “OUT OF MANY, ONE” to pay honor for the tenth anniversary of 9/11. She is accepting hand tracings from people of different cultures to construct a flag about 12 feet wide. “I wanted to make a big community flag,” she said. Over 500 Long Island residents lost their lives during the 9/11 attacks. The 344 Nassau residents and 178 Suffolk residents who died are honored at separate memorials in each county. The mission of E Pluribus is to speak out and celebrate diverse America and especially to point out equality within gorgeous difference of expression, she said. It is not too late to get involved. For those interested in being involved in OUT OF MANY, ONE, go to E Pluribus website and download a submission form. 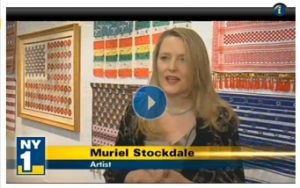 Artist Muriel Stockdale, creator of E Pluribus – Art Flags that celebrate diversity is honored to continue showing at Charlotte’s Place (109 Greenwich Street above Rector Street). Stop in weekdays between 12 PM and 6 PM to see them and the 13 by 8 foot community flag – Out of Many, One which a public art project created to honor the tenth anniversary of 9/11. Hundreds of hands from around the world are linking for an international commemoration of 9/11. Artist Muriel Stockdale’s “Out of Many, One: A Community Art Project,” is a project to create a 12-foot-wide American flag out of pieces of handprint-covered fabric sent by participants from around the world.